Welcome to this whimsical, thoroughly delightful oracle filled with the wit and wisdom of Wonderland. Inspired by Alice's most famous insights and adventures, you'll discover beings whose messages will help you find your way through the rabbit holes, labyrinths, pools of tears, mad tea-parties and unjust courts of life. 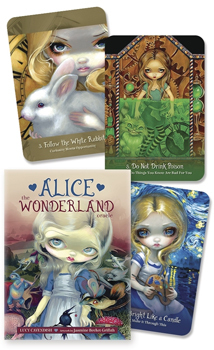 Prepare to meet the best-loved characters of Wonderland, including the Cheshire Cat, the White Rabbit and the Mad Hatter, all captured in stunning paintings by acclaimed artist Jasmine Becket-Griffith. Beautifully written by beloved author and witch Lucy Cavendish, this rich and imaginative deck is destined to become a true collector's item. Alice: The Wonderland Oracle is for the curious, the daring, and for those longing to make of their lives the most marvelous adventure. Boxed kit includes a 45-card deck and 132-page guidebook.